The Game Boy was my first gaming device. As the years went by I would upgrade to the Game Boy Advance and finally the DS. Looking through my old collection I realized I had a large variety of Game Boy games available. 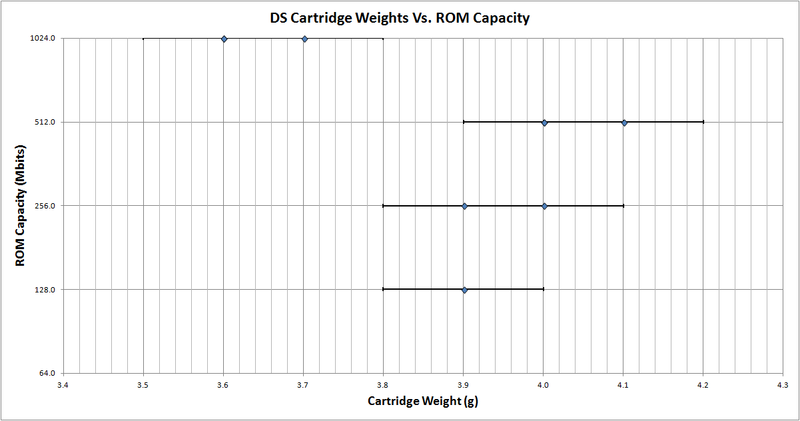 Ever since weighting my N64 Cartridges for an older article, I've been tempted to do it again. Unfortunately, the letter-scale weighing only in ounces, with its precision closer to +-0.5oz, meant its measuring value was rather limited. Since that time, I have purchased a scale that could measure to +-0.1 grams and was giddy to try it out. What better way then weighing my old Game Boy collection?! The culmination of the measuring effort can be viewed in the table at the bottom of this article. 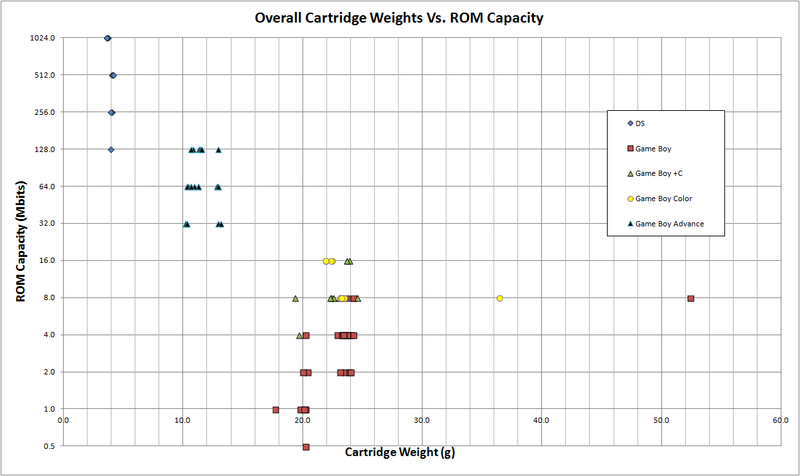 The names, weights, cartridge color, and ROM sizes were measured by me personally. The remainder of the data, such as the release date and publisher information were culled from a variety of sources including wikipedia.com , IGN.com , metacritic.com and gameFAQS.com . For the most part I believe the information to be correct, though feel free to leave a comment below to the contrary. Now that all this information is on-hand, what can we do with it? Analyze! First off, take a look at the picture included at the heading of this article. It is clear that as each gaming generation progresses not only do the Game Boy cartridges become lighter in build, they also contain more storage data for games. A very interesting fact that is echoed in transistor density and wafer size for processors. As the y-axis is on a 2-base logarithmic scale, it is an exponential change. 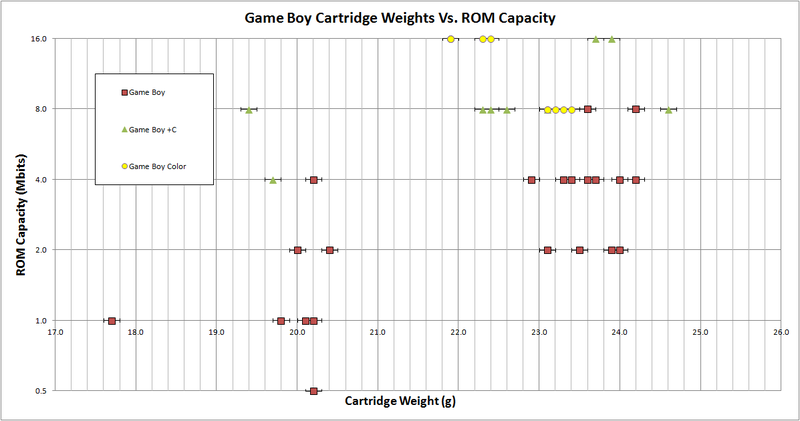 In this next graph we're going to examine the original Game Boy cartridge weights. These were those square-ish, usually gray cartridges with that singular bolt in the back. I'm rather favorable to the design as the notch in the corner allowed the Game Boy to hold the cartridge in place, and prevent ejection while the system was on. This also prevented Game Boy Color backwards compatibility. 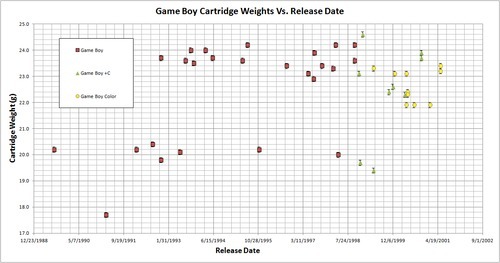 Looking at this graph, it would appear that there's not much of a difference between cartridge weights and whether it was a GB+C cartridge. 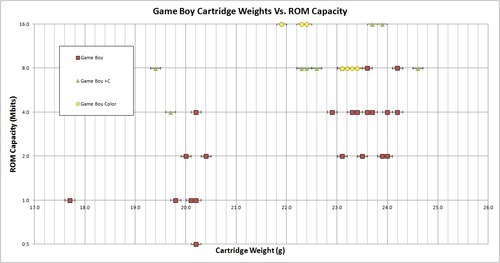 Color Game Boy cartridges appear to have a larger capacity for the same weight however, echoing the earlier advancement in technology, as well as specification allowed capacity increases. Bubble Bobble was a weird outlier here at being comparatively light. Super Mario Land apparently also had a tiny ROM capacity, though not the lightest weight. Cartridges, in comparison to CDs, can be thought of as modular. Developers were able to add new chips onto the board for extra features. Reflecting this, there is a noticeable difference between the weights of games that opted for password progress in lieu of battery saving. 'A Bug's Life', 'Kirby's Dream Land', 'Star Wars', to name a few, were on the lighter side of the spectrum, and had password progress saving. As a rough estimate, games without batteries seemed to be about 2-3g lighter. 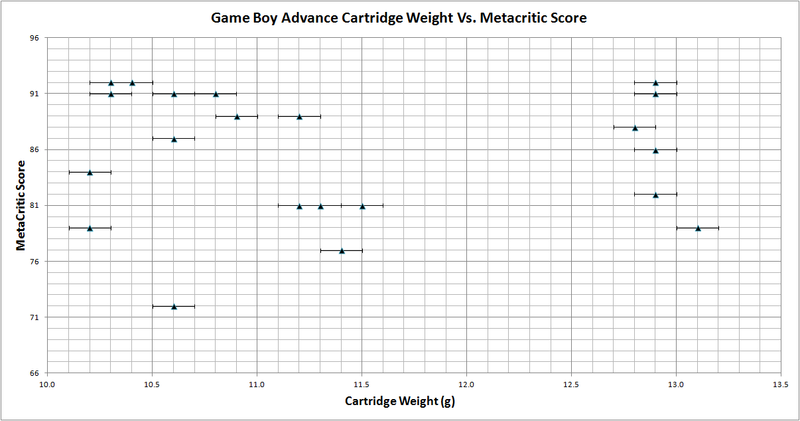 I can't really say why there was a measurable difference between seemingly equivalent games like Pokemon Red and Blue. While some games did have price stickers left on, which may have affected weights, those two were not of that category. This next graph agrees with an earlier point. 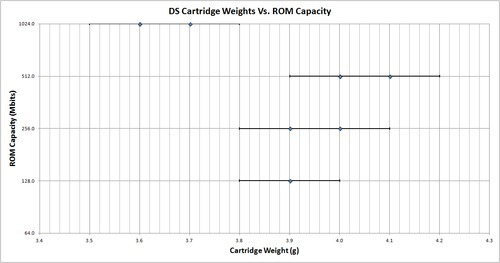 As technology advanced into the next generation, the cartridge weight decreases. 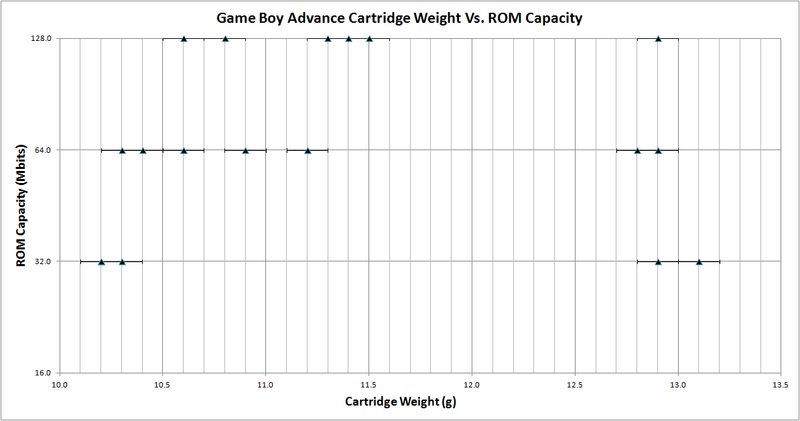 Moving onto the Game Boy Advance I didn't notice any notable trends. There is a large gap between two groups of data-points on the graph. With the exception of Pokemon Ruby, which has an internal clock to watch the passing of time and may top the weight, I don't have an explanation for the disparity. 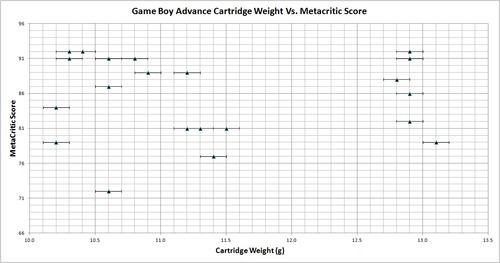 Game Boy Advance games were the first Game Boy games to be cataloged by Metacritc. 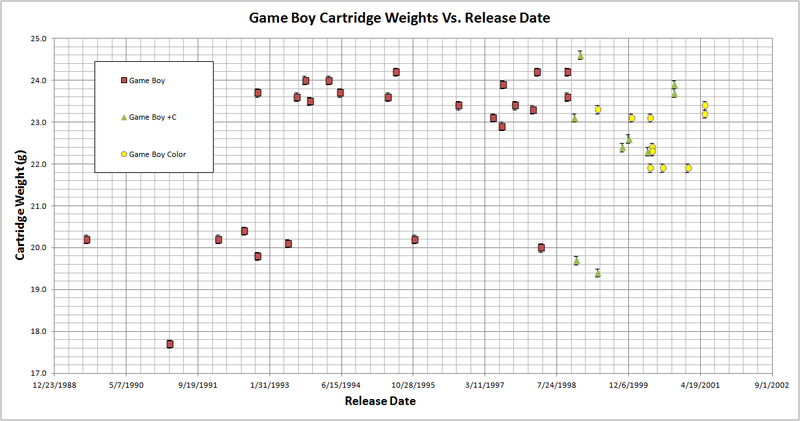 I would see no reason for a game's rating to be linked to its weight, and this graph reveals likewise. Finally let's finish off with the DS. It was around this time that I began gaming less on hand-held devices, and the amount of games I have sampled is testament to that. Still, in my time with the device I was entertained by Elite Beat Agents, Rub Rabbits and other games unique to the touch screen. Despite the small sample size it does reveal something interesting. The games of 1024Mbit capacity are actually lighter than of the lower ROM capacities! Heh, gotta lock technology. Below you can find all the data used to compile the graphs. There are a couple games I know I have, but couldn't find them to measure. If I have the chance I may update the table [But probably not the graphs] with more games. Hopefully I'll get around to re-weighing the N64 cartridges. The larger chip sizes would probably give a larger spread with my more precise equipment now available.